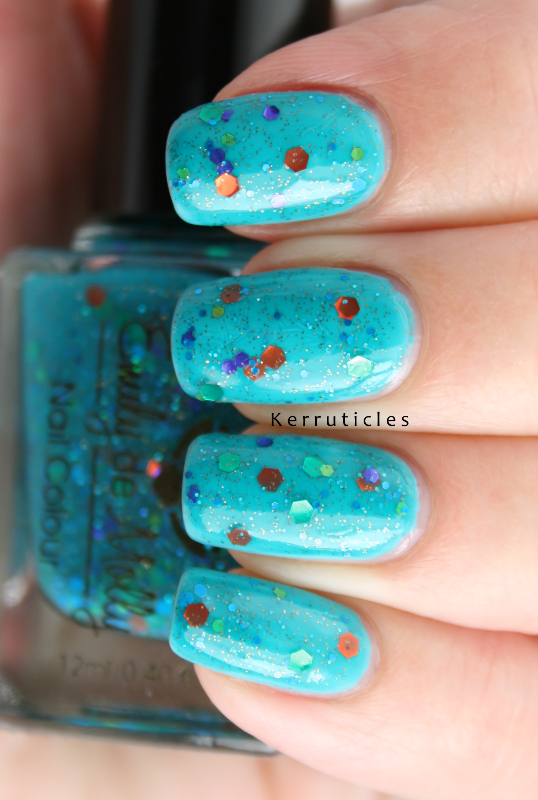 It’s so frustrating looking at beautiful indie polishes that we can’t easily – or cheaply – get here in the UK. I’ve long been an admirer of Emily de Molly polishes, so I was thrilled to find out that Sally Magpies was going to be stocking them. It didn’t take me long to choose from the stock. I limited myself to four polishes and was so excited when they came. I bought Majestic Flight, Harmony, Sakura and When Planets Collide. I was already wearing a turquoise manicure, and I layered Majestic Flight over it. This is just one coat and I love how it looks. 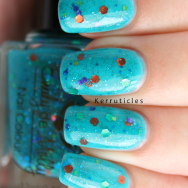 Other swatches I’ve seen of this polish show it in 2 or 3 coats, so it looks deeper and more teal. But the base I’ve used is Barry M Turquoise, which still shows through a bit, and which lightens the whole look. It is described on the Emily de Molly Etsy shop as a teal green jelly/creme base with lime, green, copper, orange, blue and purple glitter. I recently read an interview with Hayley, the creator of Emily de Molly polish, in which she said that Majestic Flight is inspired by the colours of a peacock. I’m in love with this wonderful polish. It certainly looks majestic! I notice that on this post you used Seche and on your other post Sally Hansen instadry, how does the SH compare to Seche? I’m too impatient with topcoats since being “spoiled” by how quick Seche is. Sally Hansen Insta-Dri is my usual top coat (and sometimes No. 7 too). It dries really quickly, touch dry about as quickly as SV, but doesn’t seem to harden off as quickly as SV. So I usually use SV when I’m about to go out or something, and Insta-Dri/No. 7 at other times. I’ve just bought two new top coats to try out though: Essie Good To Go and Nina Ultra Pro. Might do a comparison post now I have five different ones! I was so busy with questions I forgot to say lovely polish, hope one day to get some of these! Yes, it’s good, but not good, if you know what I mean! I could buy a lot more, but I mustn’t. The recent Chanels plus piCture pOlish and now Emily de Mollys are bankrupting us! the peacock inspired glitter is so pretty!